The past 12 months stood out as another landmark year for digital marketing with a host of new innovations and ideas beginning to transform the way we work, communicate, and grow our business. Just when you thought you were up to speed, however, along comes 2018, a year that promises yet more developments in an ever-evolving industry. If your business is to stay ahead of the curve in the new year, it pays to know what to expect from search, social, advertising and more. That’s why our team have put together this comprehensive guide to the biggest trends set to dominate the digital marketing landscape in 2018, and how they could directly affect your business. It’s fair to say that search is almost unrecognisable from just a few years ago, with the emergence of new technologies and an influx of new media (video, images, social posts) competing with the usual blogs, articles, and websites for top rankings. In 2018, we can expect to see these two factors to continue to influence the way search marketing evolves. According to a recent report, 57% of marketers are already using AI in their work. We can expect to see this figure grow over the course of the coming 12 months, whilst at the same time witnessing a rise in the number of search marketeers refining their content to ensure greater congruence with Google’s own machine learning algorithm. Called Rankbrain, the AI program complements and enhances an earlier algorithm, Hummingbird, which places a greater emphasis on context and meaning rather than individual keywords when delivering search results. Since Hummingbird was announced in 2013, we’ve already seen SEO specialists change the way they approach content – focussing on conversational keywords to match the way modern users search the web and focussing more and more on delivering rich, meaningful experiences. Rankbrain, designed to help Hummingbird process the 15% of “unique and ambiguous” searches it receives every day continues to focus on context and meaning, but goes even deeper, taking Time on Page as one of its key factors. In other words, if Google turns up your site for a particular search query but users are immediately clicking off your site in droves, that tells Google that your site isn’t relevant to that result and drops it accordingly. If your site was relevant (and thus deserved to be ranked highly) wouldn’t users be spending more time on your page as it provides all the information they need? Since Rankbrain was first introduced, we’ve already seen SEOs placing a greater emphasis on reducing bounce rates and improving user experiences in an effort to keep users on their pages for as long as possible. With Google continuing to refine its AI-driven algorithms, we’re going to see Rankbrain play a bigger role in the way search marketers plan their content strategies, placing a greater focus on valuable, long-form content and quality user experiences. It’s no secret that the shift from desktop and laptops to mobile devices as our primary method of accessing the Internet has been going on around us for some years. In 2018, we’re going to see mobile dominate even further. Now more than ever then, it’s vital that brand owners look to optimise online experiences for smart devices, with a mobile-first approach to Search Engine Optimisation, design, and usability. Whether it’s looking for a place to eat, shop, or hang out, searching for a crucial piece of information to solve a problem in the office, or tracking down a tutorial to tackle a particularly tricky task at home, we’re using our phones to carry out these quick, fact-gathering searches (known as micro-moments) more and more often. For brand owners, the key to success will be successfully predicting the kind of information their audience will search for during these micro-moments and getting relevant information to them in a concise and timely fashion. The Age of Alexa is well and truly upon us. Last year, Amazon’s Alexa-powered Echo smart home speaker (along with rival models from the likes of Google and Apple) dominated headlines and became 2017’s must-have gadget. Brand owners should look to content marketing as a powerful tool for voice search optimisation, as those conversational phrases look and feel much more natural in a longer piece than they do crammed into your landing page copy. In the US, smart speakers like the aforementioned Amazon Echo are expected to be in more than 55% of homes by 2022. This year alone, we’re going to see an increase in the number of digital marketers preparing to deliver non-visual experiences to users through these devices. Savvy business owners will be wise to start thinking about vocal content and how their brand is presented on devices with no visual display. An increase in the number of diverse platforms, content types, and online experiences has meant mapping the customer journey has become an increasingly complex task over the last couple of years. The good news, is that in 2018, we’re going to start gaining a much clearer and more in-depth understanding of the paths our customers take. This is thanks not only to improvements in analytics software, but also to the kind of behavioral insights we can only gain through use of AI and machine learning. Used effectively, a data-driven approach will empower us to discern where our customers are at every step of their route to purchase and to identify what works best at any one of the scores of customer touch points presented by today’s digital media. Already integrated into the fabric of society, social media is going to continue to shape, influence, and directly deliver both marketing and customer experiences. The platforms may have changed by the story remains the same: Valuable, meaningful, and timely content remains the most valuable asset at any digital marketer’s disposal. In 2017, we’ll find that direct marketing content takes a backseat to stories that connect with audiences on an emotional level, delivered in a variety of media. Engaging, compelling articles still have their value, but expect to see more brands utilising video-based storytelling as the year goes on. You only have to look at the recent popularity of Facebook Live and how this is being integrated streaming video is being adopted by other social platforms to understand that live video really came into its own in 2017. As the year goes on, we’ll see more brands utilising live video to tap into the kind of real-time engagement with customers that no other medium can provide to the same standard. For users in the West, Mark Zuckerberg’s social media empire will continue to remain the most popular social media platforms overall, with Snapchat topping the charts for those marketing at a youth audience. Meanwhile, WeChat remains a vital tool for those tapping into the Chinese market with more than 3.5 million monthly active accounts. QQ, another social messaging platform, and micro-blogging platform Sina Weibo follow close behind. Speaking of Chinese audiences, they are going to see an increase in the number of companies advertising to them via social media news feeds in the year ahead. Despite being commonplace in the West, news feed ads are relatively new to China, but already, analysts are predicting a growth rate of at least 50% in by the end of 2019. 2017 was the year that advertisers began to understand the unique ways that Augmented Reality could enable them to talk to customers. Ikea, for example, famously used AR to show users how a new piece of furniture would look in their home, whilst fashion brands are using it to help users see how they’d look in a new outfit without going to the trouble of trying it on. In 2018, we should expect more brands to start delivering these kind of experiences through social media, as well as delivering time-and-location-specific sponsored AR content to users when they check-in at certain places. There once was a time when influencer marketing was the hottest thing in the industry. Increasingly, however, brands are seeing that they’re simply not generating the kind of R.O.I from influencers that they could get from other marketing channels. As such, we’ll soon see the market’s days fully numbered, with brands ending their relationship with mid-tier influencers and focussing on strengthening their work with just a few major players. Last year saw more brands take advantage of social media instant messaging as a powerful customer service tool, with businesses exchanging 2.2 billion messages per month with their customers. The rise in effective, intuitive chatbots driven by AI is going to enable businesses to continue to use messaging to deliver more personalised, relevant customer experiences on a larger scale. Whilst Facebook, Instagram and Snapchat will continue to dominate and attract the most advertising spend in the Western social media industry, the biggest areas of development will actually be over in the East, with Google advertising also yielding better results for advertisers than some experts once predicted. It wasn’t long ago that some experts were writing display advertising off as dead in the water and advising brands to invest their advertising budget elsewhere. 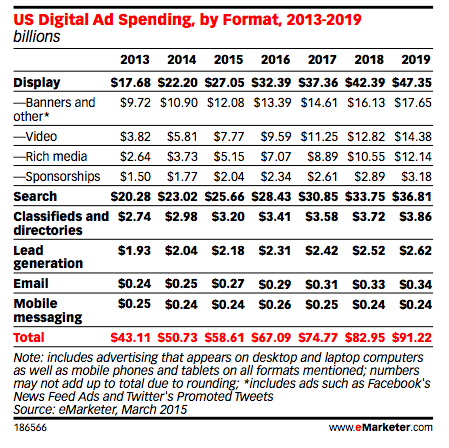 It turns out that few people listened, and according to latest data, display advertising spend is expected to top $42 billion in 2018, beating out search by 28%. That’s not to say that search should be ignored. As we’ve mentioned earlier, the growth of micro-moments will play a big factor in ensuring that search advertising remains essential throughout the coming year. Much of this revival of display advertising fortune will come due the growing popularity of remarketing, a process which involves following visitors after they leave your site and showing them your ads as they browse the web. Data shows that visitors who see remarketing ads are 70% more likely to convert, so its effectiveness speaks for itself in explaining why we’re going to see marketers increasing the amount they spend on remarketing display ads in the coming year. Marketers using Facebook Video see 135% more organic reach than those using images, meaning this is one marketing tool that simply can’t be ignored in 2018. This is especially true when you consider the success brands are already having with Facebook’s new six-second video ads, designed to help advertisers deliver faster messages. The move comes on the back of similar efforts carried out by the likes of Youtube and Fox as a means of delivering big, key messages quickly and powerfully despite the dwindling attention spans of modern audiences. Moving forward, brands would be wise to invest in video advertising as a means of capturing audience attention across a range of social media platforms. Native advertising describes the method of placing advertisements in online publications which have the same style and tone of that publication’s editorial content but which are ultimately paid for by brands. For examples, think sponsored blog posts, promoted tweets and content recommendations at the end of articles. By 2021, experts predict that native ads will account for 74% of all ad revenue, but this year alone we can expect to see advertisers allocating more and more of their budget to this type of advertising, with a particular focus on mobile-first. 2017 was packed with stories of major brands like Renault increasing their programmatic ad spending to create more efficient campaigns and gain greater control over how and where their ads are being placed. Seeing the positive results these brands have yielded, more businesses are focussing on programmatic advertising as 2018 gets underway, and we should see a significant increase in the amount of spend in this area by the year’s end. The mobile-first approach to digital marketing doesn’t just affect design and SEO. Advertisers are looking at mobile as their main focus in 2018, with more development of mobile video, native content optimised for smartphones, and in-app advertising also set to increase in the coming months. In recent months, some of China’s biggest social media platforms and search engines, including Weibo, WeChat, and Baidu have launched new tools to help advertisers focus in on their target demographic and ensure they’re delivering the right message to the right people at the right time. Much as with Facebook’s advertising tools, marketers can choose to target their advertisements to groups based on gender, age, interests, and even search history. Going forward, these people-targeting tools will be utilised by increasing numbers of advertisers to produce a greater return on their digital marketing investment. On the subject of marketing in China, expect to see some of the country’s biggest digital enterprises significantly increase their worth to both native and International businesses. With almost 60% of advertising spend going on internet advertising in 2017, this should come as no surprise. Nor will anyone familiar with digital marketing in China be too shocked to see which brands are leading the charge when it comes to giving advertisers the biggest R.O.I. Wechat, an integrated platform used for everything from instant messaging to shopping, news reading and social sharing, continues to remain the country’s most important social media platform with over 806 million users, driving parent company Tencent to become China’s most valuable tech company. Hot on WeChat’s tail is microblogging platform Sina Weibo, with over 376 million users. Together, both platforms are proving to key to many a marketer’s success in the East, and are likely to do so even more as the year progresses. Meanwhile, Baidu’s focus on the introduction of new mobile advertising features, including improved mobile CPC bidding and mobile news feeds ads see the search engine enjoying unprecedented growth and dominating search advertising. Utilising AI and machine learning presents businesses with a unique opportunity to create data-driven campaigns that engage with buyers on a personal level right from the earliest stages of marketing to ongoing customer support. Meanwhile, we’ll also see personalisation influence the way we work and interact with our CRM systems. In 2018, AI is going to infiltrate almost every aspect of the way we communicate with our customers, and will serve as the biggest game-changer for CRM. Adoption of brand new AI platforms, as well as upgrades to existing CRM systems will enable us to work smarter by automating repetitive, tedious tasks, use existing data to predict trends which can help when planning new marketing campaigns, and even analyse customer data to help us make better decisions about what action to take with new leads. We’ve already seen how increasing numbers of businesses are using instant messaging tools on social media platforms like Facebook and Twitter to provide customer service. The ability to analyse data gathered by these bots to look at customer behaviour, which can play a key role in predicting trends and making critical sales and marketing decisions. One of the biggest areas of innovation in CRM this year will see developers looking at creating intelligent synchronisation between CRM platforms and related sales, marketing, and productivity tools. Expect to see tighter integration of both mobile apps and external, cloud-based platforms into CRM systems, allowing users to improve performance, meet customer needs, and generate comprehensive analytics reports. Personalisation remains the key driving factor in delivering quality customer experiences. In 2018, businesses will benefit from using the vast quantities of data collected through CRM tools to make that personalisation possible. This involves looking at data gathered by chatbots integrated with social media messaging and other platforms to gain valuable insights into customer behaviour that can help brands deliver highly targeted, personalised messages to the right people, at the right time, via the right platform. Overall, 2018 presents a wealth of exciting opportunities for brands, businesses, and digital marketers to utilise new technologies and engage with audiences like never before. What are the biggest trends you see emerging in the coming year? What digital marketing challenges do you face, and how do you anticipate overcoming them? Join in the discussion via social media, or let us know in the comments below.